The microprocessor-controlled RI-300e repeater controller comes fully equipped with a full CTCSS and DCS (Digital Coded Squelch) tone panel, on board squelch, speech synthesizer with 693 word vocabulary, full duplex telephone interconnect, remote level control and auxiliary expansion buss. With the auxiliary expansion buss, you can connect multiple repeaters, links and remotes together. This buss is full cross-point compatible. The auxiliary buss architecture of independent controllers for each radio ensures maximum flexibility and reliable operation of your system. The RI-300e and RI-310e can operate as a repeater, link or remote base controller. The RI-300e is a full featured repeater controller that can be customized for your application. Hang time, time out timer, courtesy tones and CW ID interval are all programmable. de-emphasis and pre-emphasis audio shaping stages. This is done to maintain superior sounding audio. However de-emphasis is available for a phase modulation transmitter. You can install your controller inside your repeater or inside one of the optional chassis. We have both a rack chassis that can be configured for two controller in one chassis assembly or a desk top chassis. The RI-300e includes a programming port where you can modify all system functions from your PC/Windows95, 98, ME, NT, 2000 or XP operating system. You can save, upload and download files to your repeater controller. The RI-300e also includes FLASH program memory. You can make firmware updates without replacing any memory components in the controller. Even update your firmware remotely over a modem interconnect. The controller will even operate in a basic repeater function during the firmware upload or if any thing goes wrong during the upload. The RI-300e comes standard with CTCSS (Continuous Tone Coded Squelch System) and DCS (Digital Coded Squelch) built in. No external decoders and encoders to wire in. No special connections or modifications to make. CTCSS and DCS are ready to use.With each CTCSS tone and DCS code you can log total air time. By using System Command, all air time timers can be read over the air in English speech. Example, you can send a System Command and the RI-300e will read back in speech the total air time for that tone. The RI-300e can also cross encode tones. Any of the decoded tones or codes can be assigned a different encode tone or code. Example, when you decode 100.0 Hz you can encode 127.3 Hz and when you decode 131.8 Hz you can encode DCS code 023. The RI-300e has 3 digital inputs and 3 digital outputs and is expandable to 16 inputs and 16 outputs. These inputs and outputs are user programmable. The inputs can trigger macros and change the controller operation. These inputs can be used for alarms and many other applications. The output can be directly controlled or controlled with macros. The outputs can be used to turn on or off external items or by using programmable timers and internal events the outputs can be use to automatically turn on and off an external fan when the transmitter is on the air. The RI-300e includes a battery backed Real Time Clock. The date and time is not lost when power is removed from the controller. You can schedule up to 32 events to occur at programmed times of the day, week, month or year. You can use the scheduler to turn off and on the repeater, change the CTCSS, disable telephone usage or any user programmable feature at predetermined times during the day. A courtesy message is available to let you know that the time clock is not set and the scheduler is disabled.The scheduler also has additional features, repeater inactivity timer, interval timer, event counter, delay timers and internal events ( COS, CTCSS, PTT, etc.). If the CTCSS or DCS decode was turned off, you can program your repeater to turn the CTCSS and DCS decode back on after a programmed time of no activity on the repeater input. Use the PTT event to turn on a fan and keep the fan on for a programmed period of time after the transmitter is off the air. The RI-300’s macro command editor is unlike many other macro editors, with this editor can create macros with calls, jumps and even conditional statements (If… Then… Else…). You can build user commands that will save the current system configuration, make temporary changes and then recall the previous system configuration. You can create and assign a 1 to 4 digit name for your own custom user commands. The RI-300 comes preprogrammed with some user commands, including turning the repeater, CTCSS and other items on and off. The RI-300e uses the Texas Instruments MSP53C391 speech synthesizer with a 693 word vocabulary. All system parameters can be read back in speech. You can change any of the system messages or station ID to report in English speech. You can imbed speech messages within your User Commands. No need to copy Morse code to determine what mode your repeater is in. The vocabulary also includes command words like time of day, current CTCSS/DCS decode, S-Meter, etc.The RI-300e also has an optional Digital Voice Recorder (DVR). You can create your own messages or station ID with your voice. The RI-300e has 2 programmable sine wave tone generators. Both of these generators are individually controllable as to frequency and level. The frequency is adjustable from 250 Hz to 3000 Hz in 1 Hz steps. The level is adjustable in a range of 0% to 100% in 2% steps. You can then use the output of these generators to send Morse code or various beeps, including dial tones and busy tones. The RI-300e and RI-310e has an 8 channel full duplex auxiliary expansion buss. 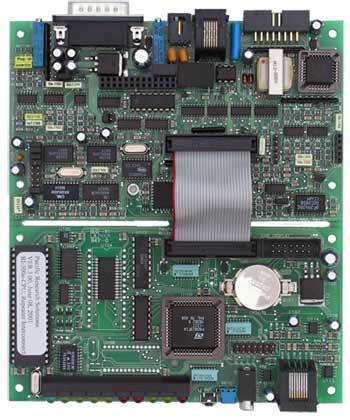 You can connect up to eight RI-3XXe series controllers together to create links or remotes. This buss is full cross-point compatible and fully programmable. Controllers can even pass commands to each other. On the expansion buss, a controller can operate as a repeater, link or remote base. This auxiliary buss architecture of independent controllers for each radio ensures maximum flexibility and reliable operation of your system. The RI-300e includes digital potentiometers that can be remotely controlled. The transmitter audio level, CTCSS encode, DCS encode, telephone audio level and squelch can be remotely adjusted. With this feature, you will no longer have to made a trip to the repeater site to adjust the audio or squelch controls. One of the most powerful features of the RI-300e is its built-in squelch (COS). The RI-310 squelch circuit is directly controlled and monitored by the microprocessor. The microprocessor performs complex math functions resulting in a high performance squelch system. The squelch starts with a fast 10 ms decay delay and extends this delay depending on the quality of the signal on the repeater input. SmartSquelch knows the difference between a hand-held moving in and out of nulls and a fast mobile flutter and will not chop up the audio. SmartSquelch will also change the courtesy message when the signal becomes noisier. This is the weak signal courtesy feature. The RI-300e can be completely customized for your application. The programming mode has security password features to avoid unauthorized programming access. Through programming, you can setup your controller with System Commands. You can access and program the RI-300e over the telephone or programming port, while the repeater is on the air and without the repeater users knowledge. With the programming software, you can read the current status into your computer, make modification and download your changes to the controller. The programming software runs on Windowns95, 98, ME, NT, 2000 and XP. The RI-300e incorporates a highly intelligent telephone interconnect. This interconnect uses a full duplex hybrid that is balanced by the microprocessor each time an outgoing call is made. The hybrid is a circuit that separates the transmit and receive audio from the telephone line before it is sent to the repeater. Most hybrids are adjusted for maximum performance at time of manufacturing. Over time, variations will occur on a telephone line and the performance of other hybrids will be compromised. Through programming, you can setup the telephone interconnect for either half duplex, full duplex or half duplex privacy modes. In the half duplex privacy mode, the mobile audio is muted to prevent other people from hearing the mobile side if the conversion. All of controllers support many incoming call modes. These modes range from simple ringing over the air to selective calling. The RI-300e also supports 99 auto dial number and a last number re-dial. With the optional notch filter installed, you can even setup the telephone interconnect as a tone remote and link two repeater sites together over a telephone line. In this mode, the RI-300e will automatically compensate for changes in telephone line quality. This feature is useful if you need to temporally link to sites together and a radio link is not practical. “1-888” calls. You can also make special “secret” telephone access commands that override the toll restriction for that call only. Up to 8 Long distance calling card can be programmed into the RI-300e. The credit card numbers are secure and are never transmitted over the air. This feature allows the user to make long distance calls and have these calls billed directly to them. With these feature, there is no need to have multiple telephone lines or multi line switch. Multiple RI-300’s or other telephone equipment can be connected to the same telephone line. When the repeater user makes a call, the RI-300 checks the telephone line for usage. If the line is in use, the repeater user would hear a busy signal and can try the telephone call later. The RI-300e has several incoming call modes. In one of the mode, the RI-300 will answer the incoming call before connecting the call over the air. The caller can enter an access code and the call would ring over the air with the selected CTCSS tone or DCS code. You can also include a 1 to 8 digit DTMF sequence with the CTCSS tone or DCS code for signaling a specific mobile in a group. In another call mode, the RI-300e will automatically answer the call and connect it over the air without user intervention. The RI-300e can be completely controlled and programmed over the telephone line. This feature includes its own security passwords for unauthorized access. You can even make a telephone call to the RI-300e and connect the call over the air to make a call to a user without anyone sending commands over the repeater. NON-VOLATILE EEPROM data storage, 100 years data retension. Radio connection (RI-310e): Vertex repeater connectors.